The touchdown-trading Rams and Chiefs may have had the week off but as Matthew Crist explains, there was still plenty to play for in Week 12 of the NFL regular season. 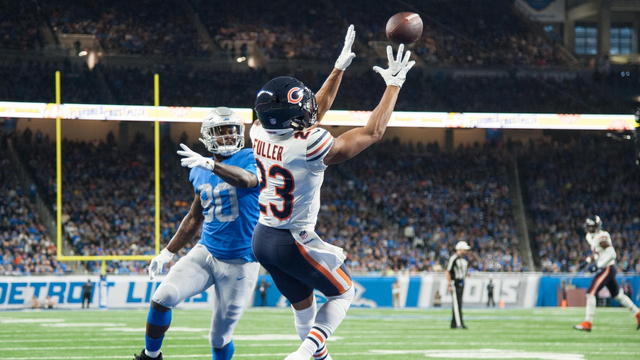 "The Chicago Bears are now legitimate playoff contenders after a 23-16 win at the Detroit Lions despite the absence of starting quarterback Mitch Trubisky as Chase Daniel stepped in to complete 27 of 37 passes for 230 yards and two touchdowns." 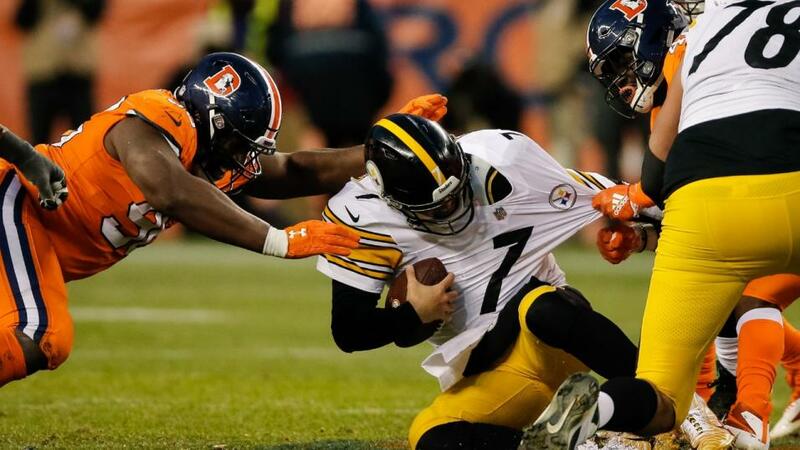 The Pittsburgh Steelers saw their run of six consecutive victories finally come to an end as they were beaten for the first time since October 1st by the Denver Broncos in a thriller on Sunday night. Pittsburgh's two-time Super Bowl-winning quarterback Ben Roethlisberger threw for an astonishing 462 yards and set-up JuJu Smith-Schuster to run the length of the field for a 97-yard touchdown - though somehow still ended up on the losing side. The Steelers had already had a field goal attempt blocked and Xavier Grimble fumbled the ball on the goal line when it looked easier to score to hand possession back to Denver as a late Shelby Harris interception secured an unexpected Broncos win as Pittsburgh slipped to 7-3-1 in the AFC North. The New England Patriots returned from a week off with a 27-13 win over the New York Jets to cement second-place in the AFC play-off places, which would earn them a week to recover in the post-season as well as home advantage. The Minnesota Vikings remain in the playoff hunt and could well have ended the chances of rivals the Green Bay Packers with a 24-17 win, while Jake Elliot's last-minute kick meant the reigning Super Bowl champions, the Philadelphia Eagles, beat the New York Giants 25-22. The Carolina Panthers lost out to the Seattle Seahawks as a last-second field goal secured the 30-27 win despite the best efforts of Christian McCaffrey who ran for a team-record 237 yards and claimed two touchdowns. 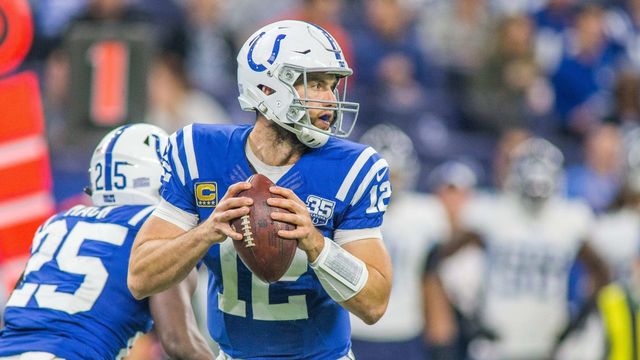 Andrew Luck continued his great form and once again threw three touchdown passes while Adam Vinatieri kicked a 32-yard field goal as time expired as Indianapolis beat Miami 27-24 to record a fifth consecutive victory and move to 6-5 in the AFC South. In Buffalo, the Jacksonville Jaguars running back Leonard Fournette and Bills defensive end Shaq Lawson were both ejected after brawling in a 24-21 win for the home side which sealed the Jags' seventh-straight defeat of a forgettable season. Philip Rivers tied the NFL mark for consecutive completions and broke records for the most to start a game and the highest completion percentage in a game as the Los Angeles Chargers hammered the Arizona Cardinals 45-10 and there were also wins for Baltimore over Oakland and Tampa Bay over San Francisco. The surprise of the weekend came in Cincinnati as the Cleveland Browns ended a run of 25 straight defeats away from home with an impressive 35-20 win over the Cincinnati Bengals, as Baker Mayfield threw four touchdown passes to keep his side's slim post-season hopes alive. A dominant 31-17 win over the Atlanta Falcons on Thanksgiving Thursday made it 10 wins in a row for the New Orleans Saints who have looked unstoppable since their Week 1 defeat to Tampa Bay, form that fully to justifies their position as favourites for the Super Bowl. Also on Thursday the Dallas Cowboys beat the Washington Redskins 31-23 in the traditional Thanksgiving matchup with Amari Cooper making two touchdown receptions, including a 91-yard catch and run, while Dak Prescott's athletic touchdown run sealed the victory which sees Dallas move into pole position in the NFC East with three straight wins. The Chicago Bears are now legitimate playoff contenders after a 23-16 win at the Detroit Lions despite the absence of starting quarterback Mitch Trubisky as Chase Daniel stepped in to complete 27 of 37 passes for 230 yards and two touchdowns as the Bears move on to 8-3 in the NFC North. 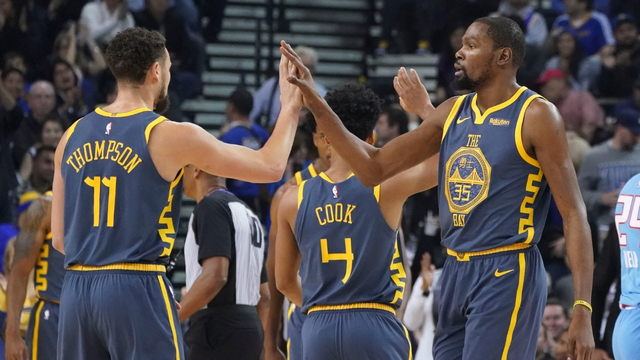 In the NBA Klay Thompson capped a 31-point performance scoring 5.8 seconds from the buzzer to lift the Golden State Warriors, still without Stephen Curry, to a 117-116 win over the Sacramento Kings on Saturday having lost four of their previous games in the Western Conference. JJ Barea finished with 20 points, eight assists and two steals in 26 minutes off the bench as the Dallas Mavericks won for the seventh time in nine games by beating Eastern Conference favourites the Boston Celtic 113-104, while Rookie Collin Sexton scored a career-high 29 points as the Cavaliers claimed just their fourth win of the season against Houston. Jamal Murray scored 22 points with eight rebounds and eight assists while Nikola Jokic and Trey Lyles added 16 points each as the Denver Nuggets secured a road win in Oklahoma City and Karl-Anthony Towns scored 35 points, including his 10th double-double of the season, in a comfortable 111-96 home victory for the Timberwolves over the Chicago Bulls. Meanwhile on Saturday there were also wins for the New Orleans Pelicans over the Washington Wizards and the Milwaukee Bucks over the San Antonio Spurs.